Print your own images and designs on custom sweatshirts for women and stand out from the crowd with a truly unique look. High-quality printing on high-quality sweatshirts, quick and easy to design with fast delivery. 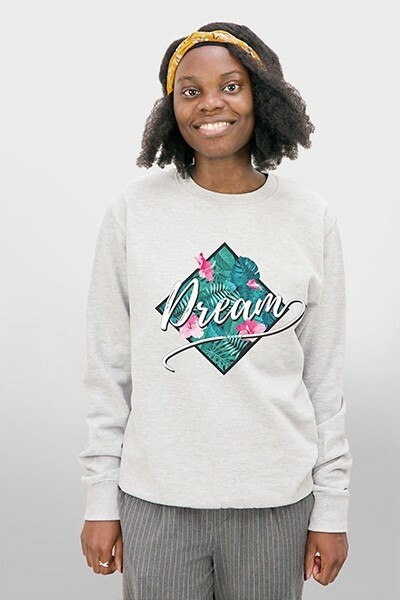 Don’t wait around for a brand to determine the message and style of your clothing, create your own custom sweatshirts and say exactly what you want. Sweatshirts make up an important but often hidden part of a lady’s closet. They are comfy, warm, and have many uses but they sometimes lack in style. Now you can design your own custom sweatshirts to create sweatshirts with the exact style and feel you want. Let your imagination run free and create those funny and inspiring sweatshirts you’ve always wanted. Our ability to allow you to design and print one or multiple sweatshirts means that you can create a sweatshirt for yourself, as a goofy gift, or for a whole group. In a mere five minutes, you will have the perfect sweatshirts. Order yours today! Creating your custom sweatshirts is much easier than you might have thought and can be done in just three simple steps. In fact, the hardest part is choosing between all of the design ideas and images you like. We’ve also got images and designs that you can use if you can’t think of anything inspiring. To create your custom sweatshirts, you just need to choose the right sweatshirt color and size and then upload your images via a laptop, phone, or a social media account. Make any adjustments to size or color you want, add some text, or emojis, and submit your order. You’re the designer now, design your sweatshirt today! Soon after finishing your design and submitting your order, we’ll start producing your custom sweatshirts. We use high-quality printers, printing in full color to create your custom sweatshirts so they will look as great as you hoped. Once we finish printing your sweatshirt, we’ll check it for any mistakes or imperfections, so you get the best sweatshirt when you open that package. It’s important to double check all of your information and designs for finalizing them. It would be a shame for your personalized sweatshirt to be sent to someone else. Unfortunately, not everything in life is this easy but when it comes to custom women’s sweatshirts and apparel, we’ve got you covered. Design your own clothing today and wear them with pride.